What is a Burial Vault? Wilbert offers multiple ways to personalize a burial vault or urn vault with words, symbols, and images that speak of a singular spirit. Your loved one had a unique personality. The selections you make for the visitation and service should communicate that singular spirit. 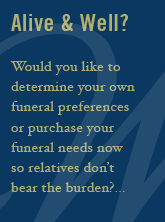 These choices ensure your loved one's memory is remembered for generations to come.